This site is optimized for a resolution of 1024x768. Should your computer run on a lower resolution, click your browser to "full screen" to see the whole index on the left!
" Northern of the Main begins Prussia " is the belief of many people. This prejudice is completely wrong and obscures the real backgrounds and propper understanding of modern history. 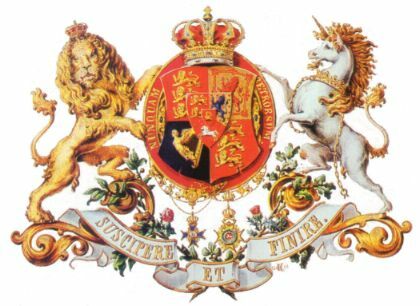 Especially English, American and Commonwealth people should know better - Hanover's Kings had been Kings of Great Britain for a period of 123 years (Georges 1 to 4 and William 4th). 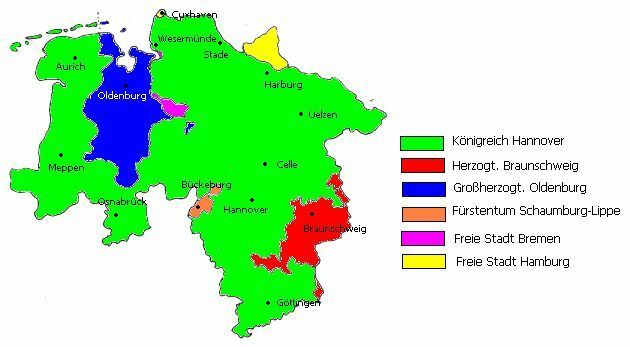 However today's German Federal State of Lower Saxony actually consists of four different countries: the Duchy Brunswick, the Kingdom of Hanover, the Grand Duchy of Oldenburg, and the County Schaumburg-Lippe. On November 1st, 1946 the British Military Government createt Lower Saxony with these former countries. Some of Lower Saxony's inhabitants still call themselves Prussians. These should risk a look into their history-book and learn about the mentioned sections above. What will they find? 1000 years of a free Lower Saxony with only 80 years of Prussian hegemony containing supression, war, and nationalism. 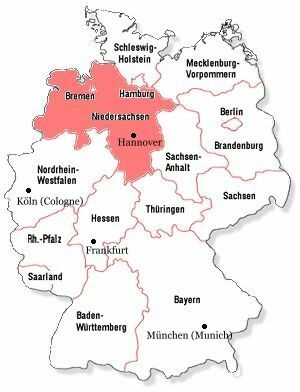 I am very interested in national history of Hanoverland, especially because my history teachers at the Lessing High School in Uelzen did not know very much about our region's history during the 19. Century. I arranged a short history of the kingdom in the last century on thies site. If someone should want to have large information or literature, pictures... do not hesitate to contact me by eMail .Or get in touch with the Welfenbund (Club of Guelphs), Klaus Groth Straße 4, D-30655 Hanover. It is worthwhile itself in each case to take history and traditions of this German state under the magnifying glass! Finally I got a banner for this website! Feel free to download and displaying it on your website! Visitors from overseas searching for genealogy: I cannot help you finding out details of your anchestors. Check the websites mentioned on the links-page for desired information!